Welcome to more Cat Questions! In my work in the community and on various forums around the internet, I have received many very interesting questions the past few months! Some I never dreamed would ever come up, and some seemed simple until I realized that though they may seem simple to me, hardly anyone has ever written about them and explained all the basics! Many of the cat questions and answers I am including here are from forums and “Q and A” sites I am a member of. They reflect the wide variety of issues that we cat lovers can encounter . Some questions have been edited to preserve the writer's privacy or for brevity. I am including many of the questions along with the responses I gave to them on this page. Also, there's an invitation for you, dear reader, to ask a question of your own! You are the lifeblood that keeps this site growing, and your input is very valuable to me. I hope you enjoy these questions and answers, as well as send in some questions of your own. I look forward to hearing your cat questions soon! Cat Question - What is wrong with my cat? She is a Scottish fold mix and is about 6 years old. For the past 2 weeks she has been sick to her stomach and won't eat. She has been to the vet twice and they have done many tests and still cannot find anything wrong with her. Between the vet and I, we have tried feeding the cat everything we can think of, including kitten food, chicken, dry and wet cat food- she wont eat any of it more than once. She will drink a little water everyday (but not much) and she goes through phases were she will eat a little bit and then go a few days without eating anything. She seems happy, the only difference is that she is more lethargic and less social than she normally is. She has lost a lot of wait and I am out of ideas on how to help her. Answer - I have to say very bluntly that you should seek out a new veterinarian. It is important to find out exactly why this is happening, and sorry, but "I don't know" is not an acceptable answer from a trained professional veterinarian. Find a new vet, preferably a feline specialist and they can get your records from the old vet. Tests MUST be run to determine if this is just a digestive problem or something far more serious. Impossible for anyone on here to diagnose, and if you were seeing a good vet, you wouldn't have to ask on Yahoo. You and your cat deserve better. Now I realize that you need information, and that's what all this is about, so until you can get your kitty to the new vet, you might want to visit PetswebMD online. It is done by animal experts and you can rely on the information you get there. It's not a substitute for veterinary care, but it may help you find some very good information and advice about your cat. Cat Question - My cat is nursing her kittens could i give her cat formula milk as an extra nutrient for her? Would this be too much for her or can it help her? Her kittens are 9 days old now. She eats well on her food but doesn't seem to drink much water. Answer - Actually your cat will get a lot more help from a vitamin supplement like Pet-Tabs for cats. Pet-Tabs are made with brewer's yeast and malted milk and cats love them! Plus your kitty will be getting a blend of 20 essential vitamins and minerals, including the extra taurine all cats (especially nursing ones!) need. If you want to give your cat some milk, please be sure it is lactose free such as CatSip milk for cats. Most cats are actually lactose intolerant so by giving lactose free milk you can be sure she doesn't get an upset tummy from it. Cats love CatSip served warm. Getting your cat to drink more water is important. I find that putting water dishes all around the house so it's available almost anywhere helps a lot. Keeping it fresh and clean is a biggie, too. Last resort, try freezing some of the water from a can of tuna in ice cube trays and giving her a cube on a saucer. Almost all cats respond to this. Keep an eye on Mamma Cat and if she seems to be in trouble, please get her to a vet ASAP. For health issues, you can check out the terrific Pets WebMD site. I've provided links to Pets WebMD and all the other products below. Cat Question - Why would my cat be acting so timid? She normally is very active with my other cat and dislikes being held by people. Now, she keeps cowering under couches and beds and when I pick her up, she won't leave my lap. And when you touch her stomach growls. Answer - It's next to impossible for anyone other than a veterinarian to tell you what's wrong with your cat, even with the good description of her behavior you have provided. The simple fact is, any drastic behavioral change in a cat is likely because of some trauma (which sounds unlikely from what you've said) or from some physical malady. It is likely that your cat is having some health problem which is making her very defensive, and has her feeling vulnerable. That would explain her not hanging out with the other cat anymore, and using you as a safe place. (read more here: https://www.mycatsite.com/cat-litter-box-training.html), and hairball blockages, both of which can be diagnosed and treated by your veterinarian. Please take her to the vet's office as soon as you can. And when you take your cat question everything and mention everything that's been going on. Cat Question - Is it cruel to put cats on leads when they go out to play? I'm getting a cat tomorrow and don't know anything about them, I don't want it to go missing or get hurt so I plan to keep it on a long lead when it goes out, is this ok? Answer - No, it's not that it's cruel, it's just that, like children, they should have some supervision. Your cat is MUCH better off being taken for walks or out on a supervised lead than if you just let him roam though. Hopefully, your cat be and indoor-only cat. There are many reasons to support this, including disease, abuse and risk of injury. Cats can be perfectly happy indoors, as long as you provide them lots of toys and interaction with other pets or humans. And it's a proven fact that indoor cats live more than twice as long as outdoor cats. 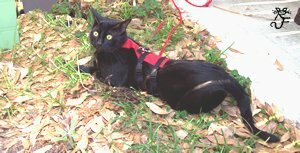 As for tying your cat out, you really should supervise when your cat's on a lead, since he might become tangled, or encounter a snake or other outdoor danger anyway. There are some very good harnesses (a collar will not do, they get out of them) and leads for cats. Many are on the store listed below, at discount prices. I hope you will get a good harness and lead and hang out with your kitty when he's outside. You will have the fun of watching him explore the outdoors, And he will be much safer. 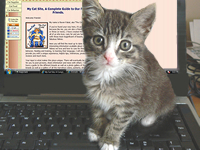 If you want to learn more about cats, please visit page on Cat Supplies and my Cat Supplies Store. Thanks for your cat question, I'm sure others will benefit from reading about it. Congratulations on your new cat! Cat Question - Our female kitten is acting very rude, should we return her for a male? We bought a kitten back in January, but my fiance was getting ticked off because the kitten wasn't giving her ANY attention and would completely ignore her. So what we did is that we got another cat which happens to be a 3 year old female, and ever since we got her, our kitten got really ticked off at us. What she does now is ignore both of us, gives us dirty looks, doesn't let us hold her, bites us when we try to hold her, the list goes on. To be blunt, she's acting like a *****. We're really close to returning her because she's ticking us off and isn't respecting us or giving us any attention. We're thinking we should replace her for a male because she's jealous of the other female cat. What do you think? 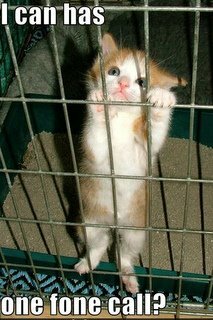 We did not bring a cat in here to feed and give shelter in order for it to **** all over us and treat us like dirt. Answer - Please forgive me if this sounds rude, there is no offense meant, but from the tone of your letter, I have to say you sound much more like "dog people" to me. This sounds less like a cat question than a people queston (are you ready for any pet?) to tell you the truth. Gender, by the way has been proven NOT to have any influence on whether or not a cat is friendly. Different breeds have different personality traits and some are more gregarious than others, but this sounds like it goes deeper than gender or breed. I'm never one to advocate abandoning a cat just for mild behavioral issues, but you sound like this is REALLY a problem for you and your fiance. Cats are often aloof, especially when they sense your anger. Your feelings toward her "We did not bring a cat in here to feed and give shelter in order for it to **** all over us and treat us like dirt." is probably having a negative influence in addition to now having to get along with another strange cat. A) Your cat may need more alone time than you are willing to give, and yes, they will ignore you a lot sometimes. B) Some cats never like to be held, and never will. C) Cats aren't too big on showing gratitude for feed and shelter (or anything else for that matter). 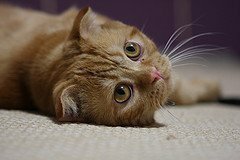 D) If you try to force a cat to do something it does not want to do (being held for instance), you are likely going to get bitten and/or clawed. How else can it tell you "No!" ? If you cannot accept your cat on these terms, perhaps you honestly should consider giving the cat/cats back to where you got them, or to someone else with more experience with cats, and maybe have a look at some dogs. Dogs will give you the respect, love and apparently, gratitude you require. Cat Quesion Dear Cat Lady, my cat is still maturing and growing!! And she is like a year and 10 months old now!! When will she come to full maturity because while she is getting calmer and bigger, she is still getting there! Answer - That's a good cat question. How fast a cat matures depends on the breed. As for calmness, it is a combination of breed disposition and environment. Some cats take up to four years to fully mature! 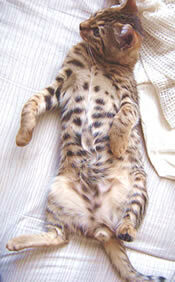 Do you know the cat's breed? 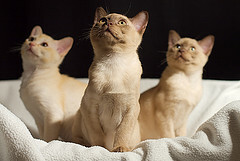 Have a look at my cat breed pages (https://www.mycatsite.com/cat-breeds.html) and if you don't find yours or the maturation information, let me know and I'll help you find the answer. Bottom line, you have a calm and happy cat, so all is well. Follow up: After speaking privately, we determined that the cat was a Bengal cat. These cats can take up to two years to mature, so now we know what the cat is and what to expect from him. Happy owner, happy cat. So that's it for this installation of Cat Questions. I hope you found it enlightening and helpful in some way. I will add more updates to the cat questions section of my site periodically, so please do come back, and tell your cat loving friends! If you have cat questions of your own, getting the answer is as easy as dropping me a line with the form below. Thanks for visiting!